The JNF claims to be ‘green’ because of its practice of planting trees in Palestine / Israel. Delegates heard that the JNF used tree planting to cover up the remains of Palestinian villages destroyed after Zionist armed militias expelled the inhabitants. Speakers described how this involvement in ethnic cleansing has been going on throughout the organisation’s history of over 100 years, especially following military expansion in 1948 and 1967; and that the JNF continues to be involved in the expulsion of Palestinian Bedouin in the Negev desert, to create and fund Jewish-only parks and settlements. Campaigners argue that these actions amount to the crimes of ‘apartheid’ and ‘ethnic cleansing’, illegal in international law. 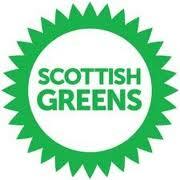 The Scottish Greens condemned the JNF for using the ‘green’ label to practice crimes against the Palestinian people. The Greens add their endorsement to an international campaign to stop the JNF, launched by Palestinian civil society and international solidarity activists including Jewish anti-Zionists earlier this year. Last month the Israeli cabinet approved plans for a large-scale ‘transfer’ of 30,000 Palestinian Bedouin in the Naqab (Negev) desert from their ancestral lands and a further plan schedules the eviction of 27,000 Bedouin from their lands in the West Bank. An Early Day Motion, tabled by Jeremy Corbyn and Gerald Kaufman in March is gaining support from MPs who believe that there is “just cause to consider revocation of the JNF’s charitable status in the UK”.